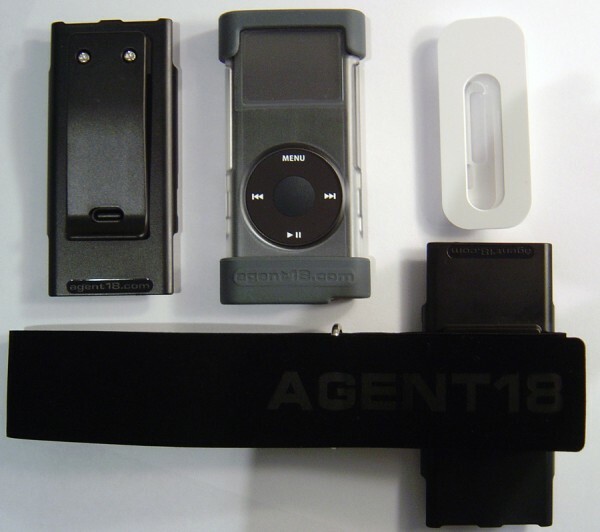 Last year we tested out the Agent 18 Shield for the original iPod Nano, which was prone to scratches, and were quite pleased with the results. Agent 18 was kind enough to provide us with their brand new “NanoShock Kit” (hardcase) designed specifically for the second generation (aluminum) iPod Nanos. Although the new iPod Nanos are more resistant to scratches, they are still pretty flimsy and purchasing a case is good investment. 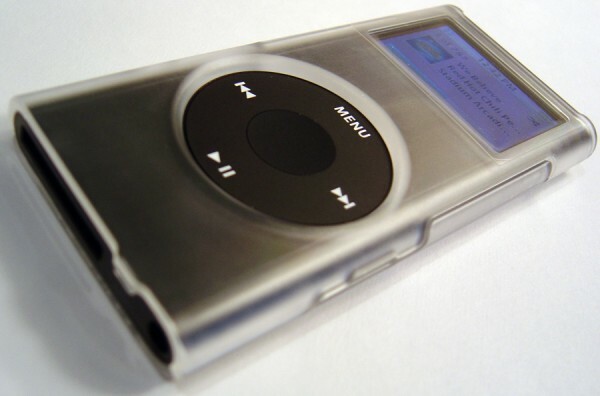 The two-piece shield snaps onto the back and front of any 2nd generation iPod Nano. 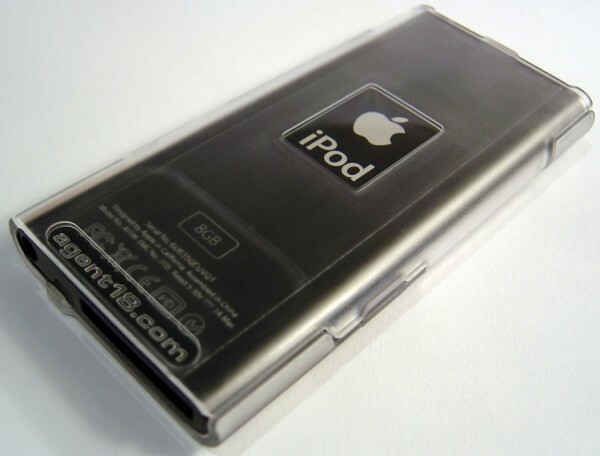 The case protects all parts of the iPod, including the entire screen. The case does a good job of protecting the nano; however we wish Agent 18 included some extra material to protect the exposed click-wheel. The top and bottom aren’t protected with what is provided in the NanoShield Kit, however rubber ends are provided in the slightly more expensive NanoShock Kit. The case was designed well and leaves openings for the hold button, touch-wheel, connector port, and headphone jack for easy use. Agent 18 also provides a special Universal Dock Adapter, shaped to fit the Nano while in its case, for use with standard iPod accessories. The touch-wheel is also is easier to use now that the case surrounds it with a thick border. The polycarbonate case looks pretty good on any 2nd generation Nano and allows to color to bleed through with ruining the look. Except for the clear plastic on the screen (and logo), the rest of the case has a “blurred-look” making scratches less visible. Overall this is one of the best looking hard cases we’ve seen, however it doesn’t look as hot if you plan to use the rubber ends provided for shock absorption in the NanoShock Kit. Agent 18 currently offers to models, NanoShield ($20) and NanoShock ($30). The NanoShield comes with the actual 2-piece Polycarbonate Case and Dock Adapter. However for an extra $10 Agent 18 throws in a belt clip, armband, and rubber ends for shock protection. Both packs are very reasonable compared to cases made by other vendors. Agent18 has started to ship these cases and it is available for order from their website. As we mentioned previously, we have been satisfied with all their products including iPod VideoShield and the original Shield for Nano. If you are extremely worried about damaging your iPod you may want to purchase the $30 model which includes the rubber ends. However the case itself does provide a pretty good amount of protection. We recommend this case since we haven’t had any issues with it other than the fact that the touch-wheel has been left exposed. If anyone knows of a case better than this one, please let us know by replying in the comments. I have decided to purchase the NanoShield based on this review. i just bought a PowerSupport case a week ago and I just dropped it once and it cracked. i just ordered this one from the apple store and i just hope this one wont break as fast as the other one did. Anyone know where i can buy this (instore)? Your local Apple Store should have these at this point. If not, they are available from Amazon, Online Apple Store, and Agent18 Store. All three of these stores are very reliable from my experience. The shipping costs are very minimal or even free. I would suggest purchasing online rather than going around looking for one. Driving takes up time and GAS! Does anyone know where I can find the rubber bumpers that fit on eithor end ? I went running and the top bumper came off and I did’nt even notice till i was home. hey…..I just got one of these and i can’t figure out how to put the belt clip on while the plastic cover is on. Is is possible? haha, I had the same question when I got it at first. So, you will need to remove the back plastic piece each time you want to use the belt clip or armband. That part of the design is a bit unusual, but you can not keep the standard plastic case on along with the strap or clip for sure. hey…I jsut got a new nano and I am so afraid to drop it I have decided to buy one of these “NanoShocks”, but i neeed to know if i can buy mine at Target, can I? Just picked this up at the Apple Store for $20 today based on an employee’s recommendation. I was worried I had been suckered when I tried to put it together on its own (I just ordered my new Nano today, and did not want it to meet the same end as my first one). Thank goodness I seemed to have made the right choice.